Honda’s loyalty to producing innovative products that elevate our lifestyles goes far beyond automobiles and motorcycles. For over 50 years they produced over 100 million power products worldwide. They continue to be the leader in 4-stroke engines development for use in generators, and many other power equipment applications. Their generators range from 1000 watts to 10,000 watts fuel efficient, low-emission, and environmentally friendly models, designed for residential, recreational, and industrial uses. Here we introduce the Honda EU2000i inverter generator review that is one of the highly recommended portable generators in the market. Full of top quality features that make it one of the top-rated generators around. Has an Eco-Throttle mechanism that automatically controls the engine speed, keeping it at the optimum level according to the load being used. Providing superior fuel economy while maintaining minimal noise level. Honda Power Equipment products are assembled at 11 manufacturing facilities around the world. Driven by its dreams and reflecting its values, Honda continues producing innovative products featuring the latest technologies giving satisfaction to their customers around the world. Boasting a huge global network offering consumers exceptional support and expertise, meeting top quality standards and the best overall customer experience. Dedicated to supplying products of the highest quality and worldwide customer satisfaction. 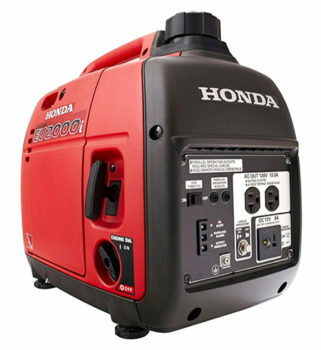 Honda EU2000i has 2000W starting power, stabilizing at 1600W continuous power. Has the powerful Honda GX100, it’s a fuel-efficient air-cooled 4-stroke overhead valve OHC engine. The Eco-Throttle system controls the engine speed based on the required load allowing the engine to run at optimum speed instead of running constantly at full speed, resulting in maximum fuel efficiency as well as reducing the noise level of the generator. Runs 3.4 hours at full load and over 8 hours at quarter load on less than one gallon of a fuel tank. This makes it great for overnight power. Special sound dampening materials also add to make this inverter generator incredibly quiet, making it one of the quietest generators around. 59 decibels at maximum rated load and 53 decibels at quarter load, it’s super quiet, your neighbors will thank you. This makes it ideal for noise enforced campsites, extra power for your recreational vehicle, or any other activity that requires a quiet operation. Weighing less than 46 pounds, it’s incredibly lightweight and portable. In addition to the pure sine wave inverter technology that ensures clean power just like your wall outlets at home. It’s a reliable stable power to operate sensitive electronics such as computers and other sensitive equipment. Protected by Oil Alert which protects the generator by shutting the engine off when the oil level gets too low. Equipped with multiple other features such as automatic voltage regulator and overloaded circuit protected outlets. Has 125V duplex AC outlet and a 12V DC outlet great for charging batteries. It’s also expandable meaning you can double your power by connecting two identical models for up to 4000W of power. USDA-qualified spark arrestor and, EPA, CSA, CARB approved. Moreover, it’s backed by top to bottom 3 full years warranty. The Honda EU2000i lacks a fuel gauge, making it hard to know how much fuel left in the tank. Oil checking and changes are not easy either due to lacking an oil extension tube for proper maintenance. It’s not suitable for powering heavy-duty appliances such as an electric saw. Lacks an LCD display for easy monitoring of power, hours, and volts used. An electric start button would also be great if it was included. Lastly, it’s a great machine but its a bit on the expensive side. This popular model the Honda EU2000i can operate a wide range of appliances, making it perfect for a variety of uses as a portable power source for home, camping, and more. At 2000 watts starting and 1600 watts running, capable of powering your electric oven, refrigerator, blender, and much more. In addition to the advanced microprocessor controlled pure sine wave inverter allows you to also charge your most sensitive electronic devices. So you can safely charge your digital camera, mobile devices, as well as run your TV and DVD player. It may not be suitable for powering heavy-duty appliances in a construction site or your RV air condition however with the parallel capability you can easily connect two of such units together for double the power. Lightweight and compact weighing less than 46 pounds, the EU2000i portable inverter generator is ideal for camping and recreation use and can serve as an emergency backup power source to keep your critical appliances running. While being a bit on the expensive side but it’s a very reliable machine, that can live with you for a very long time. The Eco-Throttle mechanism that also offers low fuel consumption. Ultimately saving your investment and saving you money. In addition, Honda’s 3-year full warranty which also shows the trust the manufacturer has in their product. And with Honda’s reliable high-quality customer service you should have no problem. It’s a great reliable machine with satisfied users and fans around the world. The Honda EU2000i portable inverter generator, not only is it safe for charging sensitive electronics, it’s also fuel-efficient. EU1000i, with 1000 starting watts and 900 continuous watts. EU2000i, with 2000 starting watts and 1600 continuous watts. EU3000i, with 3000 starting watts and 2600 continuous watts. EU3000iS, with 3000 starting watts and 2800 continuous watts. EU7000iS, with 7000 starting watts and 5500 continuous watts. They provide clean, consistent inverter generator power for electric ovens, freezers, coffee machines, C-Pap machines, air conditioning machines, as well as your electric garage door and much more. These fuel-efficient models can operate a variety of gadgets as well as operate at minimum noise levels. Due to the incorporated latest inverter technology in these machines, they are also capable of charging the most sensitive electronic devices, such as smartphones and laptops. With minimum total harmonic distortion (THD) they are, therefore, safe to use with any computer processed application. They come in lightweight designs as well as maintaining best fuel economy. They are also very durable and they come from one of the best generator manufacturers in the world. Since the company’s established in 1948, Honda has continued on taking challenges a step ahead of time. They produced over 100 million power products around the world and they began manufacturing these small power engines in 1953. Currently, their products are assembled at 11 Honda manufacturing facilities worldwide. They produce approximately 48,000 generators with different capacities. The wide lineup of models serves a wide range of usages, such as recreational activities, and as an emergency power source in power failure or other emergency events. 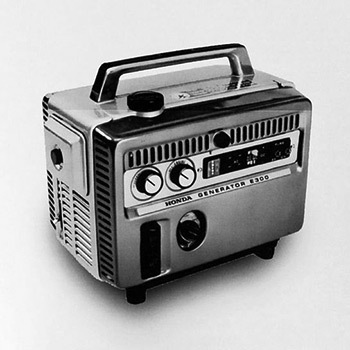 Honda’s first portable generator model was the E300. Honda pioneered the market with this best seller model in 1965. As a result, it went into the production of over 500 thousand units. Then they progressed even more to introducing the super lightweight inverter generators to the market in 1998. Achieving low fuel consumption and low noise by minimizing the vibration of the machine and engine idling as well as the parallel capability function. In 2015, Honda celebrated their success for their over 40 million satisfied power equipment customer in the United States alone. The Eco-Throttle mechanism in the current version of their top-rated model the Honda EU2000i automatically controls the engine to run with optimum speed according to the acquired load. In addition to achieving superior fuel economy, quite sound and compact size. The sine wave incorporated inverter technology can safely power various electronic devices that are sensitive to changes in voltage and frequency, and as a result, this led to the rapid expansion of the market for this model. Lastly, in the Honda EU2000i inverter generator review, we want to be clear that overall it’s a great machine with none major downsides, powerful and will stay with you for several years. Not to mention it’s the perfect companion for tailgating, fishing, hunting and camping events.